Ideal to display in the classroom to help children learn their right hand from their left. Select the font and color you wish to use for this resource from the download menu below. Enlarge, print and laminate the poster. Display the poster at the front of the class. 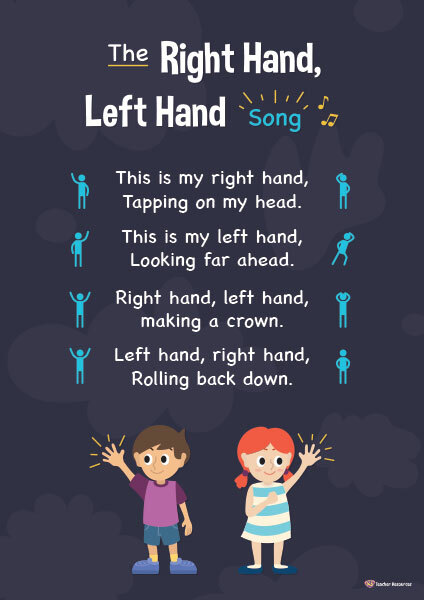 Teach the children The Right Hand, Left Hand Song with matching actions. Refer to the poster when carrying out classroom activities that require children to know their right hand from their left. To avoid any confusion, we have updated the poster by removing the “right” and “left” speech bubbles. We hope your students find this poster helpful when learning the difference between left and right. Maybe having a link on u-tube with music will make this song easier? Thank you. Hi Rajender, thank you for your suggestion. We will consider this for the future!